Small and midsize manufacturers used to manage all of their operations through spreadsheets or accounting software. For a while, that solution worked just fine, but as better technologies have been introduced to manufacturing over the past few decades, many of those smaller manufacturers have found that management method lacking. Manufacturers in today’s markets need more than a basic knowledge of what’s happening inside their organization. They need global reach and detailed understanding of internal processes. An enterprise resource planning (ERP) solution has always been the tool that helps a company move from the small and midsize business (SMB) market into wider, more global competition, but the commitment to install ERP software was one that no company could take lightly. It required a solid commitment of both time and money to ensure that the implementation was successful, and most SMBs couldn’t afford to make that move. The commitment of time and resources was more than any justifiable return, and often, the SMB made the investment only to abandon it later because it was too complicated or too costly. Times have changed. 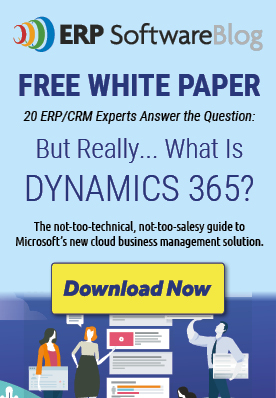 Today, small and midsize manufacturers that still use spreadsheets and accounting software as the backbone of the organization will find themselves left in the dust of companies that choose to implement an ERP application, whether it’s an in-house suite of functionality or a cloud-based Software as a Service (SaaS) application. ERP has become such an essential part of doing business that it’s changing the competitive landscape for SMBs. Those organizations that choose to ignore the capabilities that ERP enables will likely not be around a few years from now. Fortunately, ERP has changed along with the times. With the availability of SaaS and cloud-based ERP applications, small and midsize manufacturers no longer need to commit a large chunk of time and financial resources to implement an ERP application. A typical SaaS or cloud-based ERP application can now be fully rolled out in a matter of months at a cost that is probably less than the investment required to keep manual tracking methods updated. Adding ERP as a service also gives small and midsize manufacturers the technical confidence to strive for excellence in all areas of manufacturing, from planning and procurement to manufacturing and distribution. This means that small and midsize manufacturers can compete even with enterprises in markets that were previously unavailable. The result is rapid growth and expansion for some smaller manufacturers. Of course, along with expansive growth come challenges. One particular challenge for small and midsize manufacturers is the ability to gain global reach. Not only are today’s small and midsize manufacturers faced with customers who might reside in other countries, but suppliers and vendors may, as well. This introduces a new set of complications that organizations that don’t have an ERP system will find nearly impossible to navigate. With an ERP system, however, even small manufacturers can access global customers and vendors. Small and midsize manufacturers can navigate these international relationships without concern for the multinational or multicurrency nature of transactions, because the right ERP system will be designed to manage global relationships, including accounting issues, logistics, and regulatory issues. Competing in today’s market isn’t just about creating the appearance of being a large company or having global reach. Small and midsize manufacturers that want to remain competitive in this market also need to be able to respond quickly to market shifts and customer demands, and they need to be able to reduce costs while being responsive. Lean and agile manufacturing is no longer wishful thinking: it’s a critical requirement. Small and midsize manufacturers in today’s market that want to be here tomorrow need ERP to have the right planning, forecasting, and insight capabilities to be flexible while operating on less. Spreadsheets and accounting programs can’t provide that kind of insight. 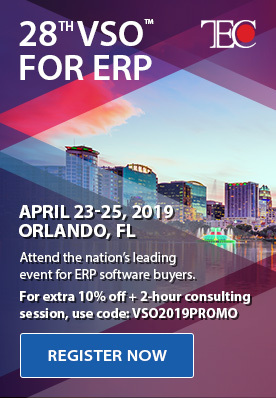 It takes a robust ERP application that can tap into both historical and real-time customer, vendor, and manufacturing data to provide detailed insight into changing trends, efficient processes, and customer demands. If this market sounds tough, consider this: competition is only going to increase. More small and midsize manufacturers have the ability to access the functions and capabilities of ERP applications. The availability of ERP in the cloud or as SaaS offerings means that it’s no longer just an option for enterprises. The landscape of this competitive market makes ERP a requirement for small and midsize manufacturers and those that choose to ignore that requirement are risking their very future.